I enjoyed doing this last week, so here I am again. We’re wrapping up a rather routine week. No glitches or bumps in the road, nor anything extremely exciting, but it was a fine week nonetheless. G’s math mostly consisted of more work on multiplication. No new tables, just working on building up the facts he learned last week. Lots of practice and oral drills. Lots of written practice with borrowing using 3- & 4- digit numbers. He learned about how pounds measure weight as opposed to volume, and how 16 ounces make up a pound. We used the kitchen scale to weigh just about everything in the kitchen. He was quite into that activity. He learned that pound is abbreviated “lb” because of the latin word for pound, “libra”. He likes finding out the “whys” behind the work he does. We wrapped up his 2nd grade Phonics course this week. It’s kind of bittersweet; we’ve worked on phonics for 1 1/2 years together, and it was fun (but tedious). Now he’s graduated. I went through my guide and used it to give him a thorough review of all the main sounds and concepts. He knows every diagraph and blend, and never falters. He has mastered all the tedious suffix-adding rules and processes. He knows his contractions and all the different ways words are used and spelled. He’s mastered phonics, and so we move on. That is the beauty of homeschooling—he doesn’t have to sit through the rest of the school year, bored by something he’s already mastered and wasting time that he could be using to learn something new. So next week, we start Language. We’re both excited; I hope we both stay that way. For Writing (Writing With Ease curriculum), I read to him from The Mouse and the Motorcycle, and he practiced summarizing the passages into his own words. He enjoyed the excerpts from this story and has declared that it’s the next book he wants to read. We have that one in our collection. He did his daily journaling as usual. Our reading aloud this week was simply stories out of an Abeka reader I picked up at a thrift store. I don’t use readers very much, but since I had this and since it’s on his level, we’re going to use it. He read a couple of stories/articles out loud from that each day. I like the stories & articles they use because they all have a strong moral and/or historical content, so it’s reading that feeds his soul as well as his mind. His reading on his own was solely from Dewey the Library Cat, a book he received for Christmas which he’s thoroughly enjoying. It’s a true story of a cat, Dewey, who was adopted by the staff at a small-town public libary, and it’s full of little memoirs of his many antics there. Being a new fan of cats, G is loving this book. I’ve heard him laughing out loud in his room during the afternoons while he’s reading it, and he’ll often come out and read to me a funny part he’s just read. History lessons were, once again, mainly Biblical this week. We’re in a time period that coincides with lots of things going on during Old Testament times, so that’s why (see our curriculum, The Mystery of History, if you’re curious about what we use. I posted about it back in August). We studied Elisha, the prophets Joel and Obadiah, and the greek bard Homer. G thought it was so funny that his name was Homer, thanks to his knowledge of The Simpsons. We touched on Homer’s The Iliad and The Odyssey, both of which G expressed an interest in learning more about. He loved studying about the Trojan Horse a couple of months back, so now he wants to read these two epics. We have The Odyssey here somewhere; I picked up a child-friendly version at the thrift store somewhere along the line, so when I find it, we might read a bit together. 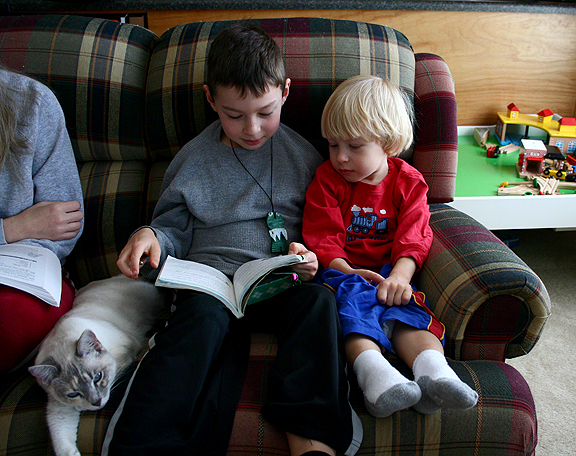 This is a pic Philip snapped of us doing our Homer lesson; Little D had scooched up on the loveseat to learn with us. Science was, as usual, experienced through daily life. With him, half of his playtime is science. 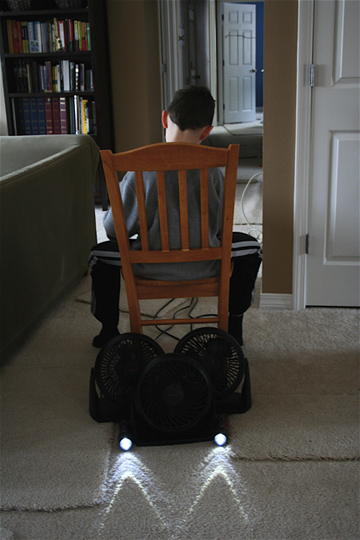 For instance, yesterday, he gathered up all our fans and set them up behind a kitchen chair to make a rocket. The fans were the rocket’s exhaust system. He had flashlights set up in strategic places, as well as a few other implements that served as various rocket parts. Another large chunk of his playtime is typically heavily based on art of some kind or another. So I don’t focus on using a curriculum for these subjects…yet. One thing he did this week was get inspired to create ads, just like his dad. He made several professional-looking ads using our big sketch pad. The companies were some of the same companies that are P’s clients. They were pretty cool ads! So that wraps up another exciting week in the Ms.Understood household (and how that fits—our family is becoming just as misunderstood as I always have been! Not sure if that’s even remotely a bad thing, either). It’s my first time participating in this, but I’ve been meaning to for such a long time. This was our second week back to schoolwork after our long winter break. We’re back into our routine by now, so here goes our very first Weekly Wrap-Up. We conquered a lot of new material in math this week, mainly multiplication—the official version. For about a year now, G’s curriculum has been teaching basic concepts of multiplication from time to time, but this week we finally began putting all that conceptual dabbling to work when he was introduced to his very first multiplication tables. First we learned the x1 table, then the x0, and finally the x2. He grasps the concept well and took to it with ease. He’s been multiplying on his own in his daily life for a long while now, anyway. He is just a really mathematical thinker. It will serve him well in life. Other things we covered were some new Roman numerals (L, C, D, and M), and slightly more complicated borrowing in subtraction (3-digit borrowing when there are zeros). Again, all easy for him, an ability which I envy. I have to say that in teaching him these concepts, I’ve gained a very good understanding of them myself along the way—another of my favorite things about homeschooling. I get to re-learn the things I missed in my schooling. And I’ve found that I’m not as bad at math as I always thought. I just needed (and still need) to learn the “whys” behind some those treacherous functions. In Phonics, the news is that G has finished Phonics! We did the last lesson yesterday. Next week I’m going to go back through my guide and spend the entire week reviewing the most important things he learned, and after that, we’re moving on to Language lessons. I’m using Rod & Staff’s English curriculum and it will intensely cover all the parts of speech, teaching him how to properly build and write sentences. I can’t wait to start it and see how he does. I’ll continue to review Phonics for the rest of his 2nd grade year, by touching on the important factors once a week, and by a once- or twice-weekly phonics worksheet. He has a strong knowledge of it all, but I want to keep drilling it in for a while so he doesn’t forget. For Writing this week (Writing With Ease), I read to him from “The Borrowers” and he practiced summarizing the passages in his own words, and a little bit of dictation work. I wasn’t too fond of this story, and I don’t think it was his favorite, either. He also wrote in his journal each day, as usual. This week’s history lessons were mostly biblical. We studied the Phoenicians one day, the divided kingdom of Israel the next, and we ended the week with Elijah, the fiery prophet. G got a kick out of how the our modern-day “phonics” comes from the Phoenicians. For his read-aloud, he continued reading from “Socks”, by Beverly Cleary, and finished it this week (we’d been reading it before our winter break and picked it back up last week. He reads one half to one chapter per day out loud). G was sad to see it end; he really enjoyed this book, especially now that we have our own cat in the house. He giggled through so many parts. Science was infused throughout daily life as usual, as well as art— he worked throughout the week on his latest art project: his cartoon strip about a silly, sarcastic camel and his adventures. And that’s our wrap-up for the week! Can’t see how it’s anything but boring to anyone besides us, but then again, I tend to love reading about other homeschoolers’ days, and I learn a lot from them. So perhaps our week is meaningful beyond our little world, as well. I hope to do this again next Friday!